The team first assembled in The Thanos Imperative: Devastation one-shot (Jan 2011). They starred in a four-issue eponymous limited series, along with a Groot/Rocket Raccoon co-feature that was previously announced as a separate limited series. A second 4-issue limited series, Annihilators: Earthfall, began in September 2011 and concluded in December 2011. In August 2014, the team appeared in the original graphic novel Thanos: The Infinity Revelation by Jim Starlin. After a string of galactic-level threats (the Annihilation Wave, the Phalanx's Conquest of the Kree, the War of Kings, and the Cancerverse invasion), Cosmo tries to fulfill the dream of his deceased friend and former Guardian of the Galaxy, Star-Lord, by assembling a proactive team to stop threats before the universe is in danger. He recruits the most powerful individuals he knows: the human Quasar, the Kree Ronan the Accuser, the Shi'ar Gladiator, the Korbinite Beta Ray Bill, and Herald of Galactus Silver Surfer. Each of them is initially resistant to the idea, but agree to join after they work together to defend Kree territory from Blastaar. They are joined by the Galadorian Spaceknight Ikon, who needs their assistance protecting her planet from Doctor Dredd. After fending off Dire Wraiths and Immortus, they ultimately reveal Doctor Dredd to be a skrull imposter. Later, while trying to end a conflict between two factions of the Universal Church of Truth, the Annihilators learn of a plot to revive the evil Magus. 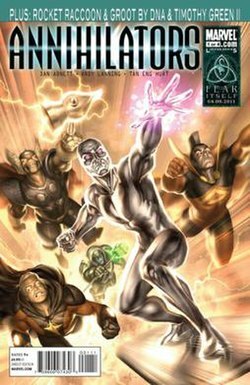 They travel to Earth where the resurrection is happening, but are unable to prevent it due to a conflict with the Avengers, who mistake the Annihilators for an invasion force. Quasar, Ikon, and Spider-Man discover the Magus has emerged from his coccoon in the form of a young boy. The Magus attempts to possess other humans on Earth, but Gladiator, Quasar, Ronan, and Iron Man are able to trick him back into his coccoon. The Annihilators take custody of the cocoon. ^ Richards, Dave (December 24, 2010). "Abnett Makes Things Dire for the "Annihilators"". Comic Book Resources. Retrieved September 1, 2011. ^ Ching, Albert (January 18, 2011). "Abnett and Lanning Round Up the ANNIHILATORS". Newsarama. Retrieved September 1, 2011. ^ Adler, Matt (February 28, 2011). "Interview: Dan Abnett and Andy Lanning on Annihilators". iFanboy. Retrieved September 1, 2011. As a second feature in this series, we'll also be getting the eagerly awaited Rocket Raccoon/Groot story. ^ Richards, Dave (July 23, 2010). "CCI: DnA Script All-Out Anthropomorphic Action In "Rocket Raccoon & Groot"". Comic Book Resources. Retrieved September 1, 2011. ^ Ching, Albert (July 23, 2011). "SDCC 2010: Abnett and Lanning on ROCKET RACOON & GROOT". Newsarama. Retrieved September 1, 2011. ^ Beard, Jim (June 10, 2011). "Annihilators: Earthfall". Marvel.com. Retrieved September 1, 2011. ^ Richards, Dave (September 1, 2011). "DnA Put Our Planet on the Brink of Annihilation in "Earthfall"". Comic Book Resources. Retrieved September 1, 2011.